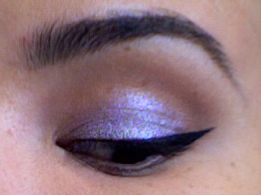 Bare Minerals eyeshadow and swatch in metallic lavender and a Sonia Kashuk small application brush. I find that this type of loose pigment shadow is sometimes easier to apply with your finger by just dotting it on. I do this occasionally when I'm in a hurry... Hey, whatever works! i love the eyeliner i can never do mine right? lol but this looks great!!! This is such a nice color to work with. thanks you ladies and gentleman!! Girl, you crack me up with that Mom pant comment. Amazing Cat Eye look, thank you for the info. 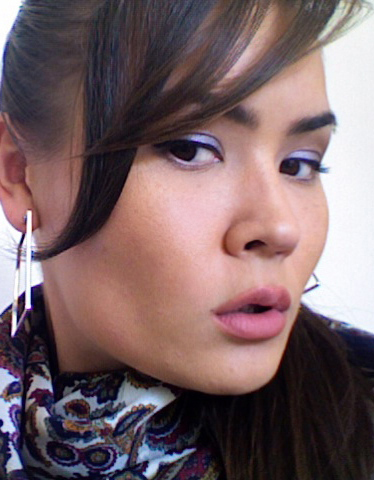 Ohhhhh I think I want to try this look on Friday. Thanks for sharing!!! lol the scarf would look GREAT on you!